Omaze.com, the online platform that offers anyone the opportunity to enter to win once-in-a-lifetime experiences with celebrities, athletes, and the world’s greatest thinkers, all to benefit social causes, has partnered with Hollywood icon and star of E!’s Fashion Police, Joan Rivers, to offer a dream experience to one winner for donations that begin at just $10. 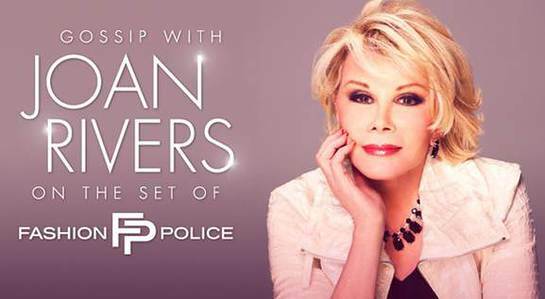 The Omaze experience will fly one winner and his or her guest of choice to Los Angeles to join Rivers on the set of Fashion Police, watch a taping of the show, and talk fashion with the gossip queen in her private dressing room. The winner will also get the chance to meet her daughter, Melissa Rivers for extra laughs. All donations for this experience will go to benefit the Geffen Playhouse. The process works similar to a charity raffle. The user-friendly site allows anyone to enter to win an Omaze experience of his or her choice by donating just $5-10. Once the deadline to enter for the experience passes, Omaze collects all the entries and selects the winners through a third party computer-generated random selection process. The proceeds are delivered to benefit a specific social cause, in this case, the Geffen Playhouse. The Geffen Playhouse, founded in 1995 by theater, film, and television luminary Gil Cates, is noted for its intimacy and celebrated for its commitment to the development of new plays. It is an active member of the community, and offers a groundbreaking education and outreach program that targets students, seniors and anyone who would not otherwise have access to theater. Omaze will accept donations to enter to win this experience until March 6, 2014. For more information about how to enter to win this experience with Omaze and The Geffen Playhouse, please visit www.omaze.com.